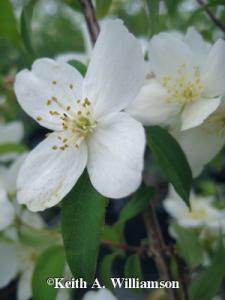 Mockorange is the April 2018 Plant of the Month – Glacier View Landscape and Design, Inc.
Philadelphus or Mockorange is a shrub native to much of the world. It is found natively in North America, Central America, Asia and Southeast Europe of which there are about 60 species that range in height from 3’ to 20’. Most that are cultivated for use in Broomfield Colorado residential landscapes and surrounding areas of the Front Range are under 8’ high and wide. 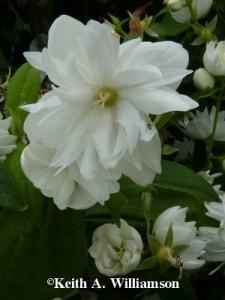 A few of the special cultivars are only 2-3’ wide and 3’ high. This landscaper’s favorite is Dwarf Minnesota Snowflake Mockorange…what a mouthful! They were introduced to the European Gardens for use in the landscape from the Ottoman gardens in 1562. So, they are quite established as an ornamental for use in the landscape. Mockorange have white flowers with four petals. 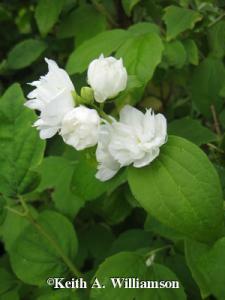 They are known for their reliable blooming in late spring and early summer. They are mostly deciduous, though a few in the south are evergreen. Ours in Colorado are deciduous. Some, like the Minnesota are double blooms. They have a distinct scent that is strong and reminiscent of citrus, hence the name. They are relatively fast growing once established, require minimal watering and prefer full sun to partial shade. Some can handle drought once established, though even, consistent watering produces the finest specimens. It can provide a beautiful background for Red Coneflower, or Red Avens as companion plantings. Mockorange are hardy from zones 4-8 here in Colorado. They do have a limited bloom time, so it is best to intersperse with other bloomers for consistency of color in the planting bed. Mulch moderately to retain soil moisture and these shrubs will not disappoint. Plant one or seven in your landscape this year for added color, diversity and interest. 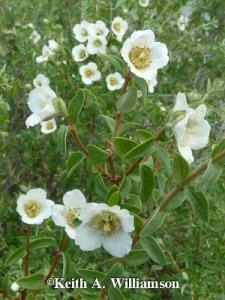 Check out last month’s Plant of the Month. Contact Dave to learn about a free consultation and estimate for your local Erie, Colorado area landscape project or follow us on Pinterest or Facebook to see our featured landscaping project photos. Pingback: Compact Oriental Spruce is May Plant of The Month – Glacier View Landscape and Design, Inc.